Guru Gobind Singh - founder of the Khalsa; saint; warrior par excellence; poignant poet; philosopher; soulful human being – was the illustrious tenth guru of the Sikhs. This extensively researched book goes beyond the established events that broadly include the untimely assassination of Guru Tech Bahadur; Guru Gobind Singh’s coronation; the battles of Bhangani and Nadaun; his stay in Paonta and Anandpur; and the historic creation of the Khalsa. The book talks about other events that sought to widely establish the Khalsa including the battle of Nirmohgarh; the siege and evacuation of Anandpur: the battles of Chamkaur, Khidrana and Muktsar; his Zafarnama to Aurangzeb and subsequent meeting with Bahadur Shah Zafar in Agra. Most importantly, it provides some unknown facts about the anointment of the holy book of the Sikhs - the Guru Granth Sahib as the eternal guiding light. Guru Gobind Singh’s prowess as a warrior of immense distinction is well-recorded, besides his understanding of military strategy and execution; the book brings to light his love for literature, scriptures and language., his philosophical, judicious and humane thought, and is a tribute to the great saint and seeks to outline the historical life, times and events of Guru Gobind Singh in intricate detail. Amardeep S. Dahiya has contributed several outrageous articles on the hypocrisy of everyday life to several newspapers including The Tribune. Dahiya published his first book Four Fingers and Seventeen Nails, a collection of short stories that became an instant bestseller. He is an accomplished orator, speaking five languages including: Hindi, English, German, Slovene and Punjabi. He currently lives in Chandigarh. By the time Guru Nanak died in 1539, he had a sizeable following, mainly in Punjab but also in little pockets along the routes he had taken on his Udasis. In spite of this, the Sikhs were not regarded as a threat by the Muslim Mughals, and were treated, at best, with a degree of cordiality and, at the worst, with a patronizing tolerance. Emperor Babur had known Guru Nanak personally and found him to be a true man of god. This is why, not only had he ordered his release from imprisonment after the sack of Saidpur, but also deferred to Guru Nanak's wish that all the other citizens be also released. His grandson, Emperor Akbar, made a visit to Guru Amar Das, the third guru's dera, in Goindwal and was so impressed by the Sikh way of life that he wanted to present a gift to the guru. The guru politely but firmly declined this offer on the plea that his needs were more than taken care of by god. The emperor, not wishing to be thwarted in his generous impulse, made a wedding gift to the guru's daughter, Bibi Bhani, in the form of a jagir of land. It was on this piece of land that the fourth guru, Guru Ram Das, Bibi Bhani's husband, founded the 'Guru ki Nagri' of Amritsar. Ironically, it was also on this piece of land that the fifth guru, Guru Arjan Dev, built the Harmandir Sahib. When the fifth guru began the work of compiling the Granth Sahib, rumours were spread by the diehard Islamist fanatics and other enemies of the Sikhs, that the new granth contained passages that were inimical and hostile to Islam. These rumours were strong enough for Akbar to take note of them and to have the draft granth examined by his scholars to see if there was any truth to the rumours. The scholars found that not only were there no truth in the rumours, but the granth contained extracts from the works of Muslim saints and scholars. The main reason for this cordiality and tolerance of the newly emerging faith, as time was to prove, was that the Sikhs had not yet defined themselves in any definite terms and were generally regarded as another fringe - reformist movement of Hinduism. This lack of a definite identity was rectified with the completion of the compilation of the Granth Sahib by Guru Arjan Dev in 1604 and the building of the Harmandir Sahib in the same year - another task that was undertaken by Guru Arjan Dev in 1588. 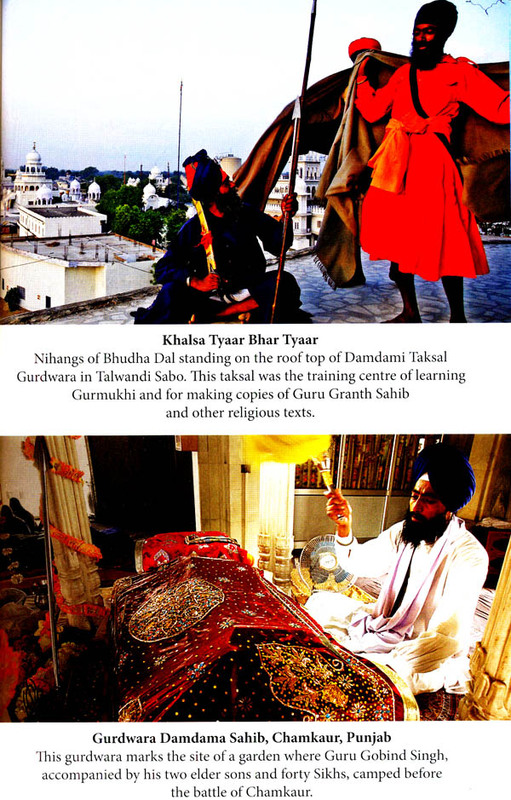 The Granth Sahib was installed in the new temple of the Sikhs in 1604. Thus the Sikhs now not only had a religious book of their own, but also a spiritual headquarters of their faith. Their identity had now been clearly and definitely established and there would never again be any doubt that Sikhism was a faith in its own right. The Sikhs were now dimnis, or people of the book, and deserved to be taken seriously. At last the Mughal rulers awoke to the fact that the new faith was attracting such a strong following, that it might well be a threat to the pre-eminence of Islam in the days to come. The days of the religious liberalism of Akbar were over and done with, and though his immediate successors, put on a facade of religious tolerance, they showed enough signs to indicate the extreme religious intolerance that would be the hallmark of the Mughal rule in the days to come. If any proof of this was needed, it came in the form of the sadistic and totally uncalled for martyrdom of the fifth guru, Guru Arjan Dev in Lahore in 1606. This tragic event marked the end of the easy, comfortable relationship which had existed between the Sikhs and the Mughal rulers. From now on there would only be hostility and bad blood between the two and even Guru Gobind Singh’s support to Prince Muazzam, (later Bahadur Shah) whom he considered to be the rightful heir, in the war of succession after Aurangzeb death, did nothing to improve the situation. Under Guru Hargobind, the sixth guru, who assumed the mantle of guruship in 1606, the process of transformation of the Sikhs from a non-violent pacifist community to a people who could stand up and protect their beliefs and ideals, had begun. Guru Hargobind carried two swords, one symbolizing his temporal (miri) powers and the other his spiritual (piri) powers. He understood clearly that times had changed and that if the Sikhs were to protect themselves, it could only be through the use of arms. He trained his followers, not only to be physically strong, but also to be skilled in martial arts. He built up an army, consisting both of the infantry and cavalry. He welcomed gifts of horses and weapons. With the new impetus that he provided to the Sikhs, more and more people flocked to his call. They saw in this call the first real challenge to the cruel and exploitative power of the Mughals, and hence, their first real chance for liberation. Threatened by this growing following, [ahangir, the Mughal emperor, arrested the guru and imprisoned him in the fort of Gwalior. There had already been anger and hate caused by the martyrdom of Guru Arjan Dev, and the wise ones of the court, fearedthat this arrest would cause this cumulative anger to burst into a violent backlash, which the Mughals would be hard put to contain. They advised the emperor to release the guru, an advice that he was sensible enough to take. 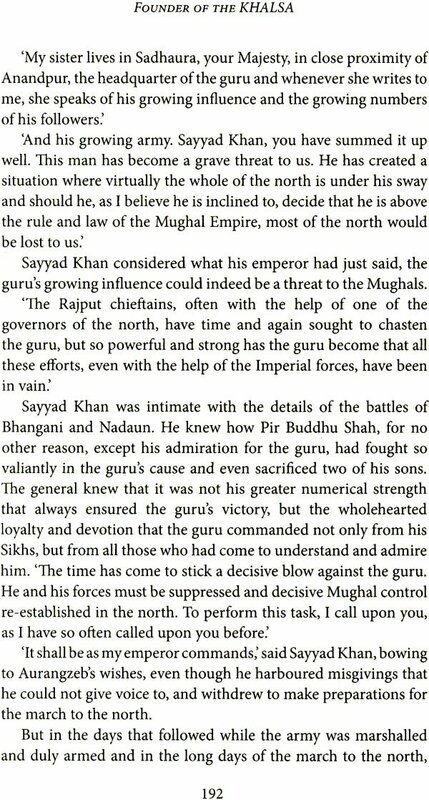 During Emperor Shah [ahan's reign, relations once again reached breaking point between the Sikhs and the Mughal rulers. Guru Hargobind fought as many as four battles with the Imperial forces and held his own in each of them. A further impetus was provided to this transformation of the Sikhs when Jaita, delivered the head of the martyred Guru Tegh Bahadur to the 9-year-old Gobind Rai in 1675. The guru had given his life to protect the right of the Kashmiri pandits to practice their faith. The young boy, who was now guru, saw what Guru Hargobind had seen before him: the survival of the Sikhs now depended entirely on their skill in war and he began working assiduously to fine hone this skill, both in himself and in his people. The culmination of this process came in the birth of the Khalsa, on Baisakhi in 1699, an event, which the author of the present work has described in graphic and telling detail. The Khalsa are the pinnacle of the Sikh faith. They are both pure and fearless. They have risen above all internal evils and freed themselves of all fears of the body, the mind and the spirit. With such an indomitable army, the Sikhs became a formidable force. Little wonder then that Guru Gobind Singh was enabled to carry out such brilliant military campaigns. Guru Gobind Singh is, arguably, one of the most-fascinating, remarkable and colourful personalities in Indian history. We see him first as a little boy, with a wisdom way beyond his tender years, advising his father that the most apt sacrifice that he could make to the cause of the Kashmiri pandits, was his own life. We see him as an adult with the multifaceted, many splendoured personality of the ideal Renaissance man. He was a warrior of exemplary valour, skilled in the use of all the weapons of the day. He had a keen and intuitive grasp and understanding of the art of warfare, he was a brilliant military strategist and a general par excellence. He was an excellent administrator and leader of men. He was a linguist with an outstanding command over Gurmukhi, Urdu, Farsi and Arabic. He was a poet of tremendous ability who could, at once, move you to tears and rouse you to take up a sword and pledge your life to the cause. He was, like almost all the gurus, a great musician who composed both soul-stirring and heart-rending melodies. At the release of my book on Guru Nanak in Mumbai, a few years ago, I was asked how one could reconcile the almost Gandhian abjuration of violence by Guru Nanak and the emphasis laid by Guru Gobind Singh on being well-equipped to exercise violence, if necessary. I replied to the best of my ability. But even to my ears the answer was lame and far from satisfactory. The present work answers this and other enigmatic questions posed by Guru Gobind Singh's life and personality, with brilliant lucidity. It is deeply researched and we know that Amardeep does not make any statements lightly. Yet the book never takes on the tone of a serious academic tome. He keeps his style simple and light and, as a result the book flows with the flow of a gentle stream. A serious and heavy subject is transformed into an eminently readable book, a book that I wish with all my heart that I had written.